With so much competition out there, the repurposed baseball or rubber bone might not cut it as dog toys anymore. The newer models are scented, can be filled with treats and have intricate surfaces for the pooch to bite on among many, many other features. In a similar fashion, you’d be surprised at what you’ll find in the awesome dog collar department, as well as pet paraphernalia with a narrower purpose, like cool dog boots to wear indoors and outdoors. This rubbery dog ball seems to have it all: creases to be chewed, empty spaces to hide treats, and a pleasant vanilla smell to make it more engaging to your furry friend. It comes in 2 sizes and three high visibility colors, to grab the dog’s attention when it’s time to play and yours when you need to find it. It’s made from thermoplastic rubber in the USA, so you shouldn’t worry about any potentially harmful chemicals as well as the impact that this item will have on the environment, considering that it is 100% recyclable. This latex chicken promises to fulfill your dog’s need for thrashing small animals. It has a rubbery latex skin, and it’s filled with plush, so the dog won’t find it that easy to pierce, transforming it into a potential choking hazard. It should be noted that this only applies to small-ish dogs and pups, as this is too flimsy to stand up to bigger animals for long, and dogs tend to find it very enticing, as it is brightly colored and lets out a satisfying squawk sound when bit on. Again, this might act to decrease its lifespan, but the Globken sells cheap enough to be worth all the fun your dog will get out of it. The classic chew bone might not make any funny sounds, but it’s sure to last. This Benebone product also incorporates a clever design, which will allow the dog to get a better grip on it for chewing. Shaped like a Y, 2 of the arms will act as supports when pressed upon, leaving the third free to be chewed. This will mean less frustration for the pooch, who might very well get glued to its new toy as it is scented with natural food ingredients. There’s a choice between bacon, chicken, and peanut available, as well as three different sizes. This is basically a puzzle box for your dog, which allows him or her to enjoy the treat after solving the task of rotating it the right way. 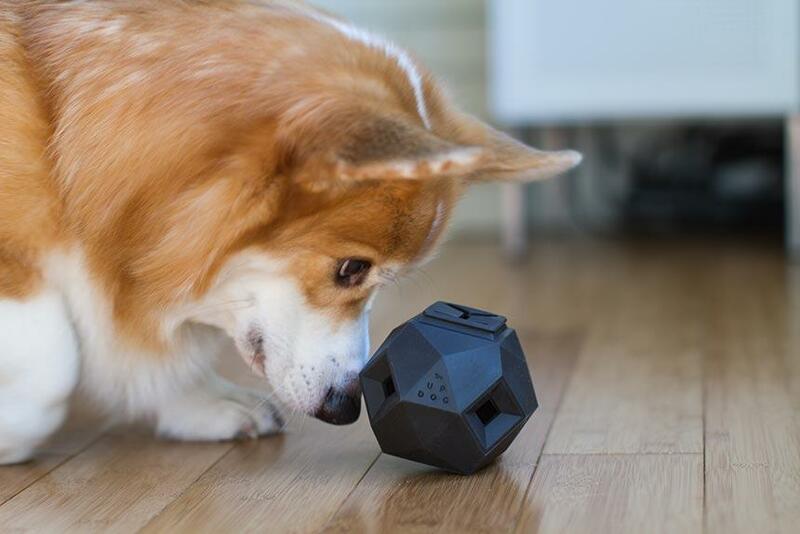 In order to promote an active lifestyle for your dog, you can set this ball to various levels of difficulty, as the pup masters it, so the pet will be forced to put some amount of effort into getting to the treat each time. Made out of 3 non-toxic plastic pieces, most people who’ve purchased it report that this is fairly sturdy and can hold up to rough play if the dog gets frustrated and tries to chew it open. Humans are not the only mammals that need to floss their teeth, and this tug toy allows your dog to do just that while allowing it to express its natural behavior. Brightly colored with red, white, black and dark blue, cotton strands, most pooches love tugging away at this three knotted rope and might do so for quite a while, as it is reported to hold for months under serious abuse. The 3 knots will act to safeguard your fingers from particularly excitable pullers, and you’ll get the same number of these regardless of size, which can range from 15 to 36 inches, depending on your option. The King Cozies line is definitely one of the most popular series of dog’s plush toys on the market, and it already contains quite a number of different models. While these are all built with an extra layer of material for increased toughness, their life span is determined to a great degree by how popular they will prove with the dog, who might choose to either cuddle with or eviscerate them. From what we can tell, the pink elephant seems to soothe animal urges the best, and might make a good choice for particularly aggressive breeds. This oddly shaped rubber toy has been around for over 30 years, and it’s still going strong. There are a number of features that give it its appeal — the natural rubber composition which is safe to chew on by dogs, the fact that when thrown, it bounces in an unpredictable direction keeping your playful friend on edge and not in the least, the fact that it can be used with a number of treats. This item is made in the USA, and it can be found in a number of sizes, to accommodate different dog breeds, from Pomeranians to Great Danes. The Gnawsome ball lights up upon impact thanks to an internal LED, catching the dog’s attention and making playing in low visibility conditions a good deal more fun. But this is not all that it does, as it also squeaks in similar circumstances. The health of your dog also received some consideration from the designers, as this is covered in a spiky texture which massages gums for better oral hygiene. The plastic material this is made of contains no BPA or other potentially harmful substances, and it can be purchased in a variety of colors. This ball from Amuda can be used for both dogs and cats and offers ample space in which to hide treats. It has a number of large creases all over its surface, which feature spikes that serve a double purpose in keeping the bits of food in place and massaging the animal’s gums. A hole runs through it which can be filled with even more treats and the rubber material used in its construction is non-toxic so you won’t have to worry if the dog swallows bits of it, which he might do enticed by its pleasant minty smell. An interesting feature of this fetch toy is that it glows in the dark for up to 20 minutes at a time thanks to a phosphorescent fabric covering its chew surfaces. This is made from 2100 denier polyester while the ball itself is foam, with certain sections reinforced with rubber. Despite this, the manufacturer warns us that this is not really meant to be a chew toy and might not withstand to a resilient dog for long, so uses other than what it’s intended for — namely playing fetch — are heavily discouraged. Being a dog parent is no easy feat, especially as they need to be entertained properly. Keeping your dog indoors for too long and failing to offer him or her enough exercise can damage the pet’s health. It’s always a pleasure to watch your dog running around or chewing on something new, but sometimes it is difficult to select the best dog toys available for sale these days. You need to consider a plethora of aspects that can influence your final decision. One of them is the age. It goes without saying that getting a too big toy isn’t all that bad if your puppy will grow up into a large adult. However, the same rule does not apply in the case of small breeds. It is quite frustrating for your canine buddy to try to chew on something that’s too big. Think about eating something delicious right after you went to the dentist’s office. The feeling is pretty much the same if you get a new dog gift of which the size is not appropriate. Then, you need to look at the design and size of the product. As you might have guessed by now, such items made for entertaining your little furry friend can range from the best dog treat dispensing toys to good old tennis balls. Given the vast array of models that you might stumble upon nowadays, we’ve decided to take the matter into our own hands and put together a short buying guide. Perhaps it will assist you in finding just the right product. Because not all choices are made the same, one of the crucial aspects you should take into account is whether the product you’re thinking of purchasing provides enough safety. Some of the health risks posed by inadequate toys range from choking to intestinal blockage. Tooth fractures can also happen, unfortunately, and we all know how difficult it can be to manage the oral health of a puppy or adult dog. Besides, you should try to pay attention to the ingredients or components of the product. Are there any parts that might be disassembled and could be swallowed by your pet? Have there been any chemical substances that might be toxic used in the colors and design development of the item? Reading the label before making your purchase is the safest way of going about things. If the toy you’re getting for your puppy can fit into a toilet paper roll, you should steer clear of the model. Breeds like Miniature Schnauzers are known for nibbling on anything, and so any part that might be small enough to ingest will end up in the pet’s digestive system and will cause problems. It is, without a doubt, rather frustrating to have to buy such items over and over again. If you’re looking for one that can withstand a lot of abuse and the test of time, you’re in the market for an indestructible product. Keep in mind that these are a bit pricier when compared to their counterparts. The best dog chew toys can keep your pet entertained for as many hours as possible. Some of them, depending on the texture, can even keep your doggy’s teeth clean. Getting one of these choices is a good idea for those who want to protect their furniture and shoes. What makes the best interactive dog toys? While it is difficult to provide a straight answer to such a simple question, some of those you can consider are dog toy puzzles, sensory ones, treat-dispensing devices, as well as the indestructible alternatives we were mentioning previously. Automatic ball launchers are also great and can offer your pet a good deal of entertainment for a more than reasonable amount of time. They do cost a bit more in comparison to non-automatic items, however. What requirement should the product meet? It can be challenging for a dog owner to satisfy all the needs of the pet. Nonetheless, with the right toys, you can alleviate boredom, provide rewards when they are needed, offer the much needed mental stimulation that all canine buddies require from time to time, and help with mimicking natural behaviors. All dog parents are probably aware of the fact that thousands of years ago, their pets weren’t domesticated. That’s why they have requirements such as scenting, chasing, and retrieving. These are just a few. Think of the multiple ways you can improve your bond with your pet by providing him or her with several minutes of fun per day. Dogs are loyal, and the love that they offer you is sincere. Why wouldn’t you interact with your pet and spend some quality time with him or her? Treat-dispensing toys are great for people who have a hard time managing the task on their own. Something that we also suggest is to look up a slow feeder bowl. 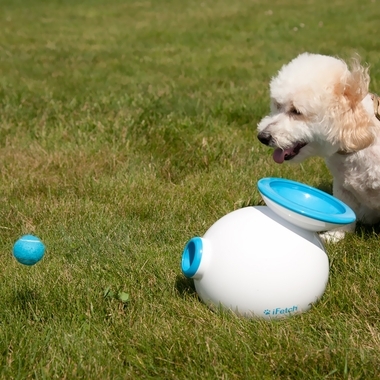 It might not be as fun to use as a treat-dispensing toy, but at least you will be able to rest assured that your pet won’t gobble down all of the food in less than one minute. Gastric dilatation-volvulus is a life-threatening condition that can occur in larger breeds who tend to eat very fast. Going through a dozen of dog toys reviews never hurt anyone and will surely not hurt you. Other pet owners can let you know what to expect in terms of safety, whether their dogs like the toy or not and even if it is good for the money. Sometimes, people will provide more budget-friendly alternatives in their reviews. What’s more, you need to think ahead and understand how much time you have on your hands when it comes to playing with your dog. If you have little to none, you definitely need an automatic option such as the ball thrower that we were mentioning above. Bear in mind that squeaker toys aren’t for all people, which is to say that the sound can get old quite fast.